One or more photo(s) has been virtually staged. 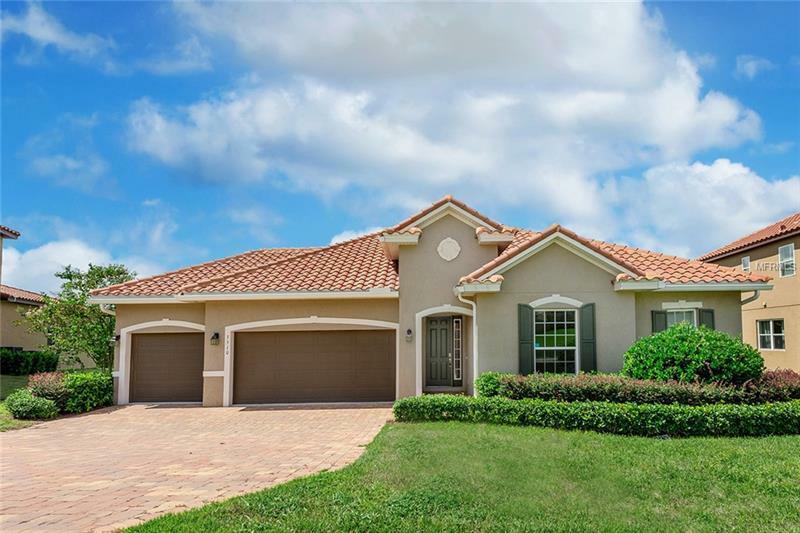 Florida living at its finest in the exclusive 74-home GATED COMMUNITY of Bella Lago! Live in peaceful surroundings in this amazing **LAKEFRONT HOME** within the rolling hills of Clermont. Enjoy breathtaking views of LAKE FELTER and beautiful sunsets in your own backyard oasis. This UPDATED HOME is exceptionally inviting from the moment you open the door with NO REAR NEIGHBORS. Flowing OPEN FLOOR PLAN is highlighted by easy care TILE FLOORS, CROWN MOLDING, and abundant windows allowing NATURAL LIGHT to shine in. The GOURMET KITCHEN is designed with the home chef in mind featuring STAINLESS STEEL APPLIANCES, QUARTZ COUNTERTOPS, GAS COOKTOP, MODERN TILE BACKSPLASH, plenty of cabinets, ISLAND with BREAKFAST BAR, and a WALK-IN PANTRY. Relax in the private MASTER SUITE with a walk-in closet and a master bath boasting DUAL SINKS, GARDEN TUB, and a separate shower. Additional BONUS ROOM upstairs is ideal for a flex room, in-law suite, or anything your heart desires. Gather with guests in the SCREENED LANAI & enjoy family cookouts in the OVERSIZED BACKYARD. The views in this peaceful oasis are second to none! Add a pool or start a garden â the possibilities are endless. Bella Lago is a serene GATED community featuring a community DOCK, playground, gazebo, and panoramic views of Lake Felter. Conveniently located minutes from HWY 27 offering easy access to theme parks, shopping, dining, & everything Orlando has to offer. Zoned for sought-after A-RATED SCHOOLS. Donât miss your opportunity to see this IMPRESSIVE HOME!